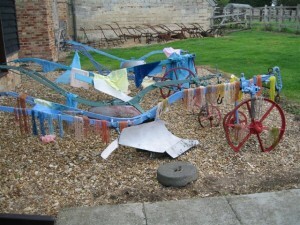 For several years I have been tutoring two workshops each summer at The Farmland Museum at Denny Abbey in Cambridgeshire and, even though the journey from Sussex means getting up about 5.30am, I was keen to continue the workshops this year after our move. I always enjoy working at Denny Abbey, not only because the setting is so beautiful but also because the atmosphere there is so peaceful. 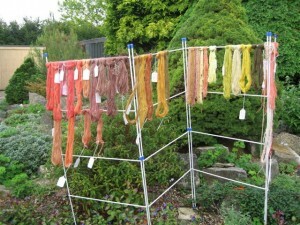 I also love to visit the dye garden at Denny, for which I supplied some plants from my own dye garden several years ago. This year was especially poignant for me, as I no longer have my own dye garden, so it was good to see the plants I had supplied thriving and flourishing. 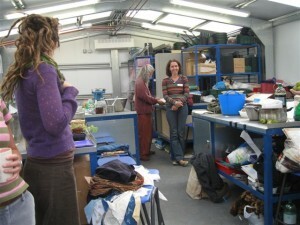 The workshop followed my usual Denny format, starting with an introductory talk . 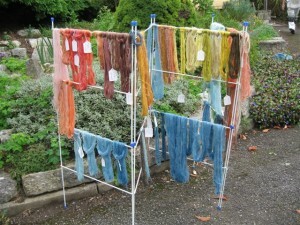 Then in the morning we dyed wool and cotton samples, using two substantive dyes (rhubarb root and buckthorn bark) and two adjective dyes (madder and weld). We then used four colour modifiers on some of the samples, which meant we ended up with five different shades on each fibre from each dye. 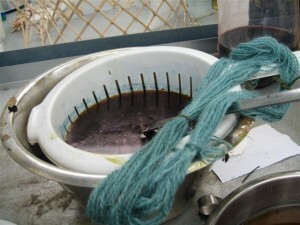 In the afternoon I made an indigo vat and we dyed some wool and cotton samples and the students were then able to dye some of the materials they had brought with them. The day finished with a session round the table, assembling the 22 wool and 22 cotton samples on sample cards and dealing with any further questions or observations. For me the high point of the day is always when the colours begin to emerge and I can see the students’ delight and hear their excitement at the range of beautiful colours we are achieving. It doesn’t seem to matter how many times I teach similar workshops, the magic of these moments never fails to fill me with pleasure. 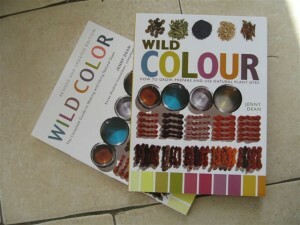 The UK version of the revised edition of “Wild Colour” is now available and the US version should be available in November. Several people have contacted me with queries about these two editions, wondering whether they are in fact the same and why one edition appears to be more expensive than the other in pounds sterling on Amazon. I thought I would try to clarify matters by explaining that the only real differences between the two editions are in the spellings of words such as “colour/color” and in word usage, such as “clingfilm/saran wrap”. As far as the plant details are concerned, there is a slight slant in emphasis in the first paragraph of the woad pages in the US version, mainly because woad is considered to be a noxious weed in some US states. Apart from that, the text on the other plant pages is virtually the same in both editions, except for some spellings. The bibliography pages in each edition also vary slightly, as the US publishers insisted on including a list of US suppliers, which meant that some titles had to be removed from the US edition’s bibliography to make space for this. I chose not to reduce the bibliography to include suppliers in the UK edition, partly because so many readers will have internet access and it is often more reliable to find suppliers that way, as over the years of a book’s life most lists of suppliers tend to become out of date. Also, because limitations on the space available would have meant that I could only have included some suppliers and not others, I wanted to avoid causing offence to any supplier not included. As far as the dyeing instructions are concerned, they are identical in each version, so it really doesn’t matter which one works from. Both editions are paperbacks and the front covers also differ slightly. I am disappointed that the words “revised and updated edition” don’t appear on the front cover of the UK version, although they do appear inside. The reason why the US version costs more in pounds sterling than the UK edition is because the US price is in dollars and has been converted into pounds sterling for sale in the UK. I have no idea why the US version has not been made available on the same date as the UK version. I’m afraid I am merely the author and I have no control whatsoever over such matters. Some people have also assumed that, as Karen Casselman seems to appear as “co-author” in the Amazon description of the US version, she must have part-written the book, which would make it a different book from the UK edition. This assumption is false. Karen Casselman played no part in this revised edition of “Wild Colour” but the US publishers insisted her name should remain on the cover of the US edition, probably because she was the “consultant” on the first edition of the book. The US publishers of this first edition insisted that there should be a known N. American “name” associated with the book, because they feared that otherwise “Wild Color” might not sell in the US, as my name would probably not be known to US dyers. Apart from providing the “name”, Karen Casselman’s role was to advise on matters specific to N. America, such as where in N. America certain plants might be located and whether there were restrictions on growing certain plants in some US states. The text of all editions of “Wild Colour/Wild Color” has always been mine and mine alone, so any errors are solely mine and not the responsibility of anyone else. I hope all these comments help to clarify matters. We have started to explore the countryside around us here in West Sussex and have come to the conclusion that we are very fortunate to have ended up here in Findon. Findon is a delightful village and everyone has been very friendly and welcoming. There are two shops here selling basic foodstuffs for our daily needs, plus a post office/newsagents/general store, and also several pubs which offer food, and an excellent Bangladeshi restaurant and take-away. 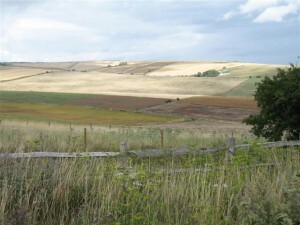 Our new home is in the South Downs National Park and very near Cissbury Ring, which is an iron-age hillfort, with the remains of Neolithic flint mines. 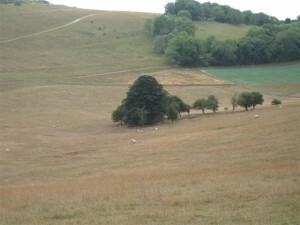 This is a view over the Downs from the base of Cissbury Ring. 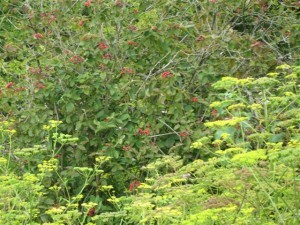 The above two pictures show some of the local vegetation. It’s interesting to find so many shrubs and flowers here that are not familiar to us from Bedfordshire and we are beginning to identify some of them. Among those we’ve identified so far, I think we’ve found wild parsnip, hemp agrimony and the wayfaring tree, Viburnum lanterna. Apparently the latter was named the “wayfaring tree” by John Gerard, the 16th century herbalist, because it was such a common roadside tree and therefore very familiar to wayfarers. 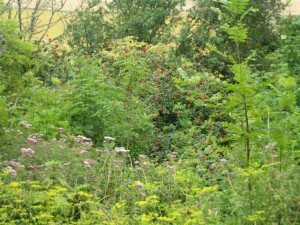 This is another view over the downs, taken on a rather dull day. If you look very closely you should be able to see some sheep in the distance, just in front of the trees. Each year in September, Findon village has a Sheep Fair, which is held on Nepcote Green, just at the end of our lane. Apparently this fair dates back to 1261, but nowadays sheep are no longer auctioned at the fair. However, this year there will be sheep judging in two categories, Downland and Rare Breeds, and sheepdogs showing their skills, so there should be plenty of sheep on show.